Here below the role the veterinary diagnostic laboratory can play in helping to confirm nutritional diseases in a flock has been described. 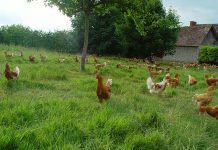 Regardless issues with feed formulation or nutrient absorption should always be a concern when flocks are experiencing reduced growth, lameness, poor feathering, dehydration, reduced egg production or poor shell quality. For the generally small number of feed-related issues, the case is usually submitted with one of the two histories: 1) immediate change in flock behavior, e.g., decreased feed consumption, mortality, paralysis, and 2) a chronic, insidious or predictable condition that has been observed in successive flocks, e.g., feather loss, reduced egg production, lameness. Investigation of the flock by the production manager or company veterinarian as quickly as possible is vital; however, upon early recognition of the condition a full necropsy to rule out infectious disease is important. What should you do if you immediately suspect a feed issue contributing to severe flock signs? If there is first hand evidence of a feed deficiency or toxicosis one should and replace feed may be prior to contacting the veterinary diagnostic lab. This will require having extra feed bins on the farm. The response of the flock to feed replacement can be interpreted along with testing on feed, water and birds, to confirm the diagnosis. The producer or veterinarian should collect 1-2 lb of feed and ½ gallon of drinking water as samples representative of what the flock received. What should you do if you suspect chronic nutritional disease or toxicosis? There will be situations where you observe chronic, insidious clinical signs that occur in successive flocks. A recurring production problem can be tackled with more thorough investigation and sample collection. Keep detailed production and feed records to be shared with the nutritionist, veterinarian and laboratory diagnostician. Feed and water samples should be collected and refrigerated 1-2 weeks prior to the predicted onset of the clinical signs and birds should be submitted to the diagnostic laboratory for full diagnostic workup including histopathology. Later, when the particular clinical signs are observed, similar feed and water samples should be collected, and birds should be submitted for additional diagnostic workup. It is paramount to rule out infectious disease as the primary cause of the clinical signs. Once infection has been ruled out one can investigate for nutrient deficiency or toxins in feed and water as well as compare necropsy findings before and after onset of clinical signs. Keep in mind that a thorough investigation requires additional feed, water and tissue analyses that can triple or quadruple the cost of the necropsy. What does a pathologist do with the birds and samples submitted to the veterinary diagnostic laboratory? What tests are readily available for feed or tissue analysis? 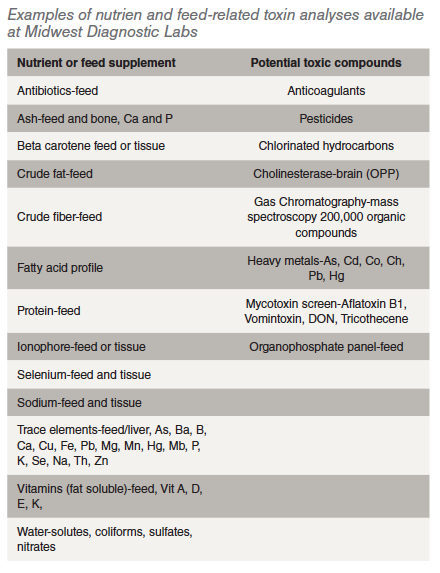 Key Examples of feed-related deficiency or toxicosis observed in the last ten years. 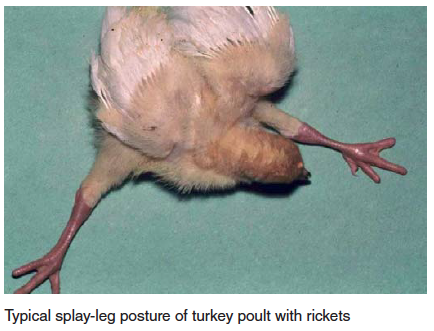 Rickets – Soft bones occurring in young birds is referred to as rickets. This disorder is usually caused by abnormal Ca/P ratios in the ration, low vitamin D3 levels in the ration, or intestinal malabsorption associated with enteric diseases. The birds are often recumbent, but bright and alert with extremely pliable beaks and long bones. In cases of rickets a complete feed analysis for deficiency of protein, calcium, phosphorus, vitamin D3, manganese and choline is recommended. 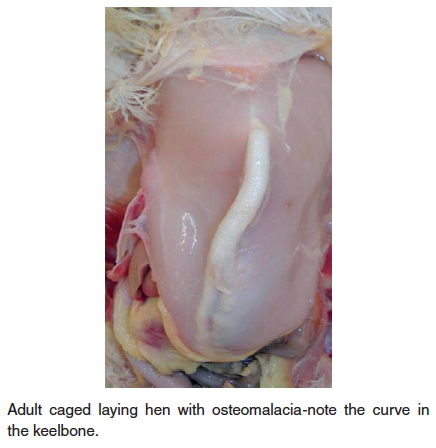 Osteomalacia – Also known as cage layer fatigue in laying hens, this nutritional disease is characterized by decreased mineral in bone resulting in soft, pliable bones including the beak, curved keel bone and beading of the ribs at the costochondral junction. High-producing hens maintained in cages can show paralysis during the period of peak egg production. Depletion of calcium in the medullary bone of the long bones is seen in caged layers; perhaps reduced activity/exercise is a predisposing factor. Affected birds can be found on their sides in the back of the cage. At the time of initial paralysis, birds can appear healthy and will have a shelled egg in the oviduct. Death occurs from starvation or dehydration, a failure of the birds to reach the feet or water. 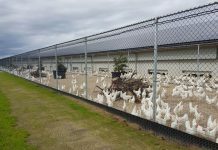 A high incidence of cage layer fatigue can be prevented if pullets receive a high calcium diet (minimum of 3.5% calcium) at least two weeks prior to the first oviposition. Older caged layers are also quite susceptible to bone breakage, particularly during transport to processing. The condition results in reduced mineral in bone (soft bones-osteomalacia) or bone with normal mineral content, but decreased in amount of total bone (osteoporosis). 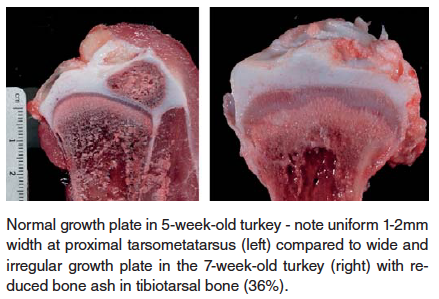 Chondrodysplasia – this condition, observed in both turkey and broiler chickens, is characterized by failure of blood vessels to completely invade the growth plate of long bones, resulting in retained cartilage cores at the growth plate. 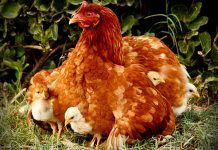 There is a strong heritability factor with this condition, but it can, especially in broiler chickens, be exacerbated by rapid growth rate and reduced Vitamin D3 in the ration. 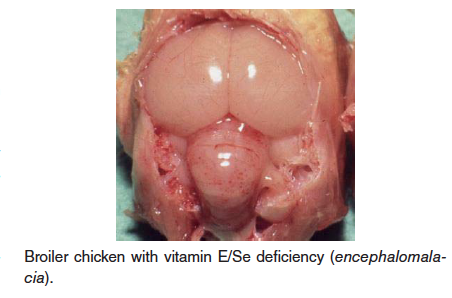 Vitamin E (alpha tocopherol)/Selenium deficiency – Also known as crazy chick disease or cherry brain, this disease is caused by deficiency of vitamin E. This deficiency is usually diagnosed in young chicks and turkey poults, but can affect a wide variety of birds. Vitamin E is a natural antioxidant and is need for maintenance of brain tissue and embryo development, especially in growing birds. Selenium is needed for vitamin E metabolism. Three conditiond associated with vitamin E deficiency are encephalomalacia, exudative diathesis, and muscular dystrophy/degeneration; these all are related to oxidative damage to cells or blood vessels. Fatty liver syndrome (hepatic lipidosis) – Fatty liver is caused by an imbalance of energy (positive energy gain) and protein intake. Fatty liver is observed most often in caged laying hens and occasionally in breeder turkey hens. Caged layers are particularly prone to fatty liver because of minimal exercise accompanied by high calorie intake; however, more cases of fatty liver in floor-raised brown egg layers have been diagnosed as well. The liver is enlarged, pale orange, soft, friable and is easily fractured. Rupture of the fatty liver with hemorrhage into the abdominal cavity is a common cause of death in laying hens. Treatment with choline chloride, vitamin K, biotin, and vitamin E in the feed for two weeks has been used to control mortality with varying results. Prevention is by use of an adequate diet with proper energy and protein levels. Aortic rupture – this condition occurs sporadically in 14-15-week-old male turkeys or older, often appearing as spiking mortality. The toms are often found dead with blood exuding from mouth and nostrils. For years this condition has been attributed to both heritability and vascular hypertension, the latter which could be induced experimentally by severe copper deficiency. Visceral gout/urolithiasis – Gout/urolithiasis is a condition very commonly seen in older layer flocks and is related to kidney failure. On occasion, gout can be a very significant part of flock mortality, sometimes as high as 0.5 % per week, but is often an insignificant cause of low-grade mortality. Kidneys can be damaged by low phosphorus diets at any age, water deprivation at housing, high vitamin D3 in the ration, or excessive calcium before sexual maturity (15 to 16 weeks). Infectious bronchitis virus can cause renal damage and is often associated with urolithiasis. 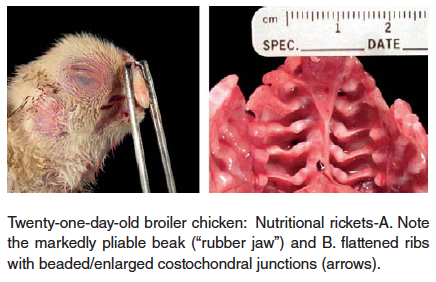 Gizzard erosions – erosions and ulcers of the koilin lining of gizzard in young poultry can cause inappetence as well as death from blood loss in severe cases. 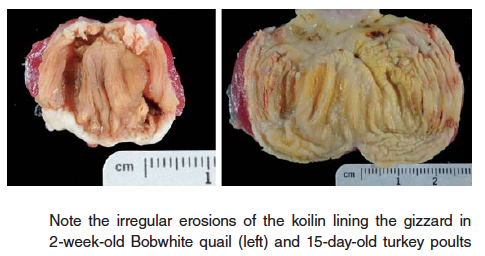 Koilin damage has been associated with adenovirus, reovirus, caustic chemicals, mycotoxins (suspected), and nutritional causes such as biogenic amines (gizzerosine, histidine) produced by rancid or spoiled fish and animal by products, especially fat. Inadequate vitamin K supplmentation in feed – Increased dietary supplements can be essential during particular stages of growth or for under treatment condition. Vitamin K is a co-factor in the blood coagulation cascade. Vitamin K is generally adequate in feed, but should be supplemented when pullets are beak trimmed by hot blade. Ionophore toxicosis – Polyether ionophores facilitate transport of divalent cations across cell membranes to interfere with osmoregulation, resulting in cell rupture. 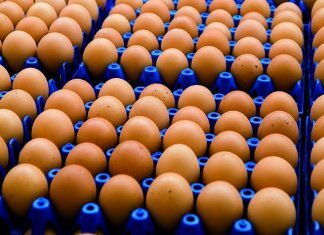 Toxicosis caused by ionophores is relatively common in poultry, because these compounds are commonly administered for the prevention and treatment of coccidiosis and are subject to overdosing and mixing errors. Additionally, these ionophores can interact with certain medications, such as sulfonamides, to cause toxicosis signs when the ionophore concentration in the feed is normal. Sodium toxicosis – this condition occurs intermittently and clinical signs can result from elevated Na concentration in either feed or water. Properly formulating sodium concentration in the ration can be a challenge if there is high salinity in soil or drinking water. In general Na concentrations of Na in feed > 0.85% (8500 ppm) and in water > 0.4 % (4000 ppm) can produce heart failure, pulmonary edema and ascites in young chicks and poults. In cases of suspected sodium toxicosis the Na concentrations in both feed and water should be determined. Young chicks or poults developing cardiomyopathy (“roundheart”) will be more susceptible to pulmonary edema and ascites even under normal sodium concentrations in feed and water. Conversely, rations that are low in sodium can cause abrupt decrease in feed consumption and dehydration in chicks and poults, with similar changes and drops in egg production in mature layers. In summary, the diagnosis of nutrient deficiency or toxicosis and supplement toxicosis in a poultry flock often requires close examination of the flock, detailed record keeping and thorough diagnostic examination by the veterinarian and/or veterinary pathologist (veterinary diagnostic laboratory). 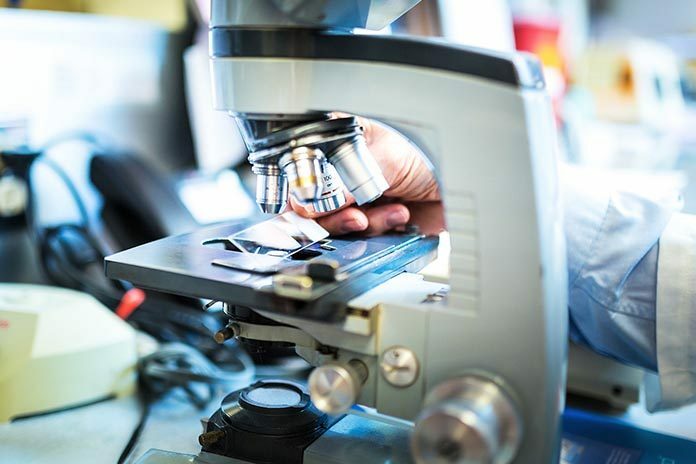 This diagnosis can be expedited by thoughtful collection and storage of feed and water samples along with careful assessment of how costs should be directed for analysis of particular nutrients or toxins. The chance of a successful diagnosis as well as treatment/prevention is enhanced by regular communication between producer, production manager, veterinarian, nutritionist and veterinary pathologist.